In 1907 Hugh Chalmers and E.R. Thomas became partners in the Thomas-Detroit Automobile Company that was building automobiles since 1905. The new factory was located on East Jefferson Avenue west of Connor Creek at what was then the Grosse Pointe border in Detroit MI. When Chalmers bought Thomas’s stock in 1908 the company was renamed Chalmers-Detroit Motor Company. In December of 1909 “The Automobile” and “The Horsless Age”, two period automobile journals, announced that Chalmers-Detroit and Hudson companies would separate. The Automobile reported that Hugh Chalmers would be trading his shares of the Hudson Motor Car Company for shares of stock in the Chalmers-Detroit Motor Company and the two badges will become two separate companies no later than July 1, 1910. With Chalmers now having full control after the deal, the name of the again re-organized company became simply the Chalmers Motor Car Company. 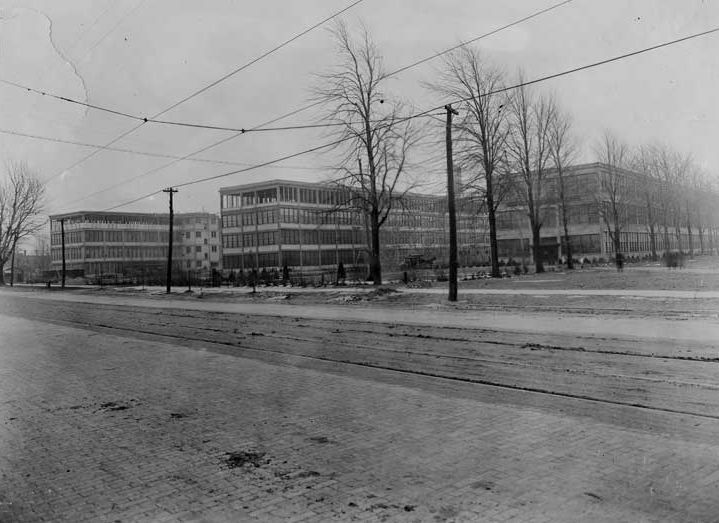 By 1910 Chalmers had a complex of sixteen manufacturing buildings on thirty acres with a total floor space of one million feet and over 4,000 workers. 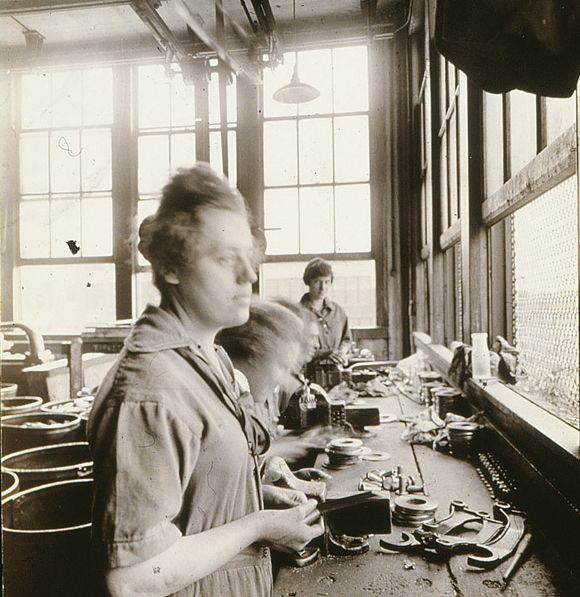 Below are production and factory photos of the Chalmers factory taken around 1910. Chalmers produced very popular cars, with production rates hitting some 20,000 units in 1915 but sales were declining by 1917. The photo below is a 1915 Chalmers taken in front of the W.S. Seaman Auto Bodies plant. 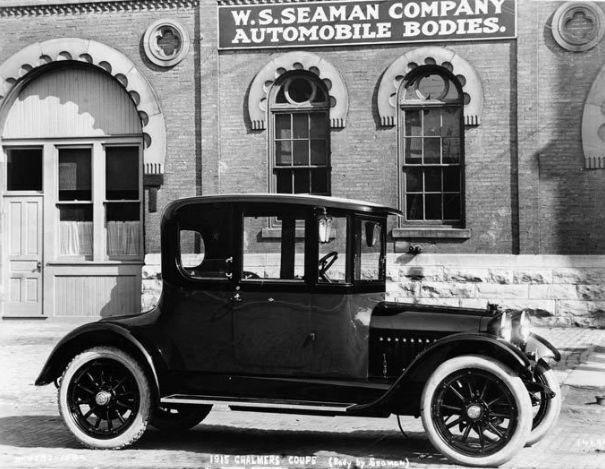 From 1909 through 1919 Seaman produced passenger car bodies for Chalmers, as well as: Case, Chicago Electric, Columbia Taxicab, Dorris, F.A.L. (Falcar), Franklin, F.W.D., Hudson, Jonas, King, Kissel, Lafayette, Locomobile, Lozier, Marmon, Mitchell, Moline, Moline-Knight, Oakland, Packard, Pierce-Racine, Rambler, Regal, Stevens-Duryea, Velie and Westcott as well as winter tops for Ford and Cadillac. I believe they also built some early telephone booths and switchboards for Chicago’s Western Electric Company. In 1921, Walter P. Chrysler acquired Chalmers and Maxwell adding a network of dealerships to his deploy for the new Chrysler he would introduce in 1924. Maxwell then re-named “The Good Maxwell”, would increase sales to 48,850 units in 1922 and become very profitable, while the Chalmers subsidiary lost $1,000,000 that same year and the decision was made to discontinue its production by the end of 1923. 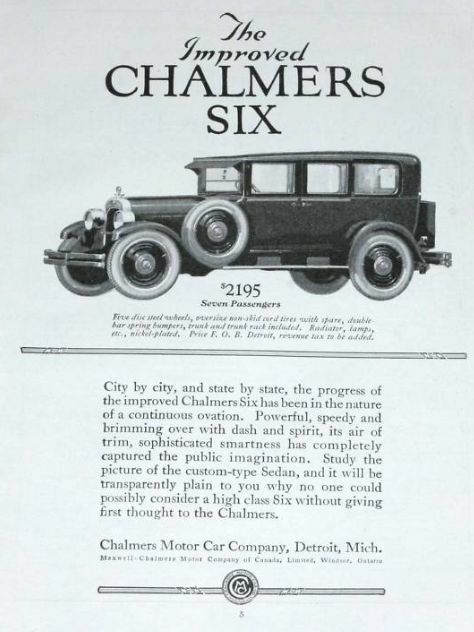 Some sources that I have read claim that Chalmers was discontinued in 1921 or 1922, but below is a 1923 ad, and the photo at the top is also a 1923 Chalmers Sedan. 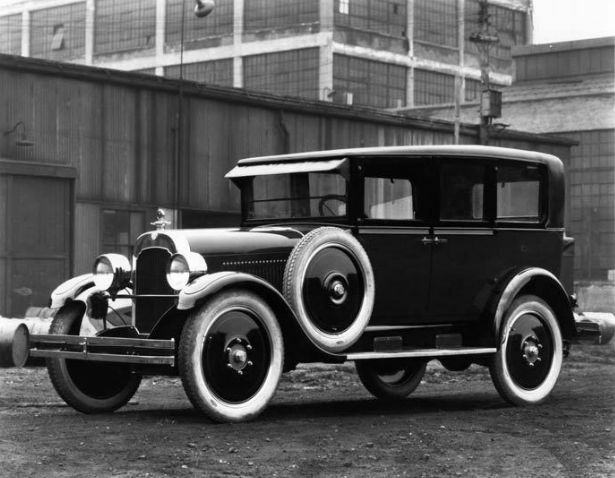 I have also seen magazine ads for the 1924 Chalmers, but there could not have been many built since late in 1923 the new 1924 Chrysler would be built in the factory. 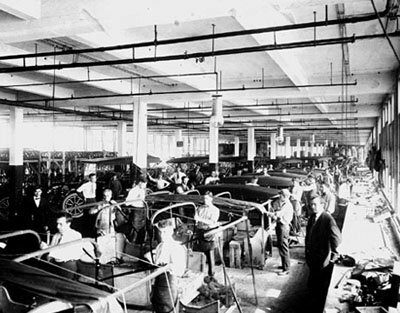 I believe the last vehicles built in the old 1907 plant before it was torn down was Chrysler’s K-cars. The Locomobile Company of America was founded in 1899. For the first two years it was located in Watertown, Massachusetts, but production moved to Bridgeport, Connecticut in 1900. The company started out manufacturing affordable, steam cars. The steam Locomobiles were unreliable, finicky to operate, prone to fires, and had small water tanks getting only 20 miles per tank. Still, over four thousand were built between 1899 and 1902. In 1903 Locomobile production switched entirely to internal combustion-powered luxury automobiles. In 1922 Locomobile was acquired by Durant Motors, which continued using the Locomobile brand name for their top-of-the-line autos. William Durant founded Durant Motors Corporation of New York City, New York in 1921 after he was removed from his position with General Motors again. This was his third attempt to build an automotive empire. Durant’s intent for Durant Motor Company was to challenge General Motors. Durant Motors Corporation built the Durant, directed at the Oakland automobile price point. 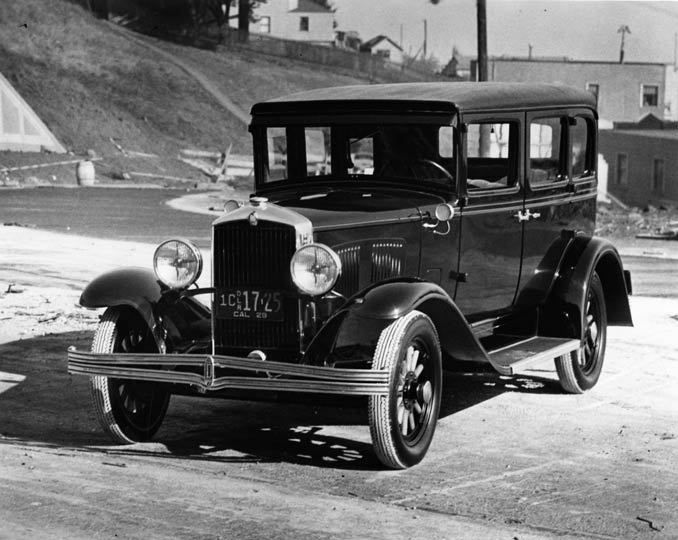 Production of the vehicle was suspended for the 1926 and 1927 model years, but they still produced other vehicles. 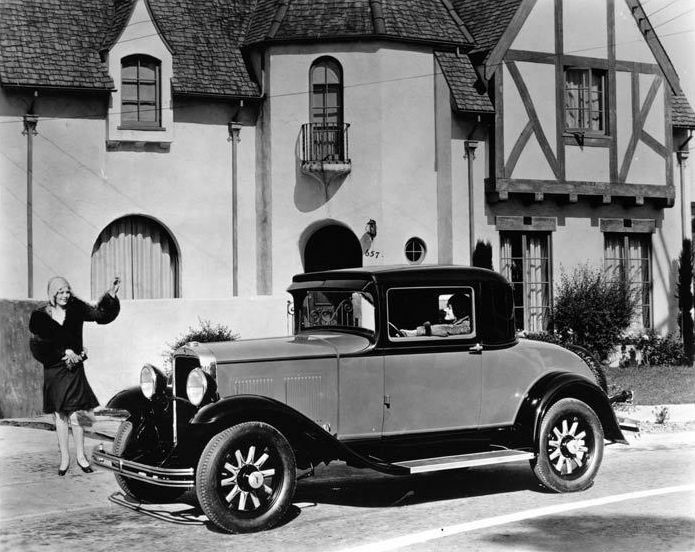 When the Durant was brought back in 1928, the car was redesigned and powered by a six cylinder Continental engine instead of a four. 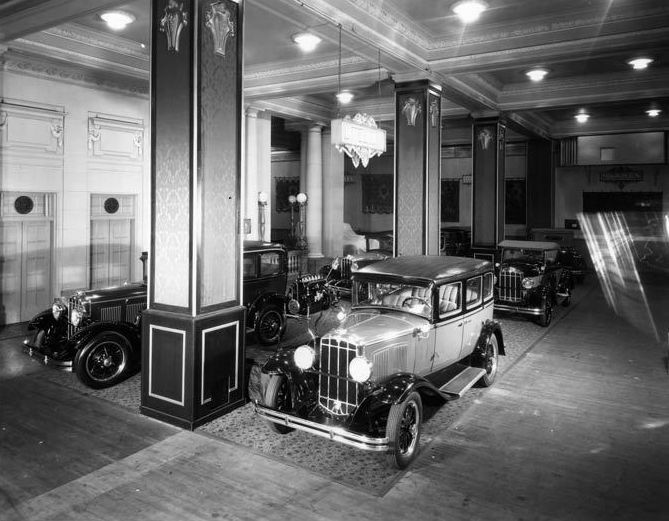 Budd Company supplied the bodies for the Durant automobile, and in 1930, all steel bodies were used. The Durant automobile is considered to be an “assembled” automobile because so many components were obtained from outside suppliers. Durant also acquired Locomobile in 1922 as a luxury automobile line, and later introduced the Rugby, both of which are on my list of cars available in 1929.